As the American population ages and is slated to live longer than ever before, the need for functional, kitchen and bath design grows daily. Whether it’s elevated or lowered work surfaces, touch activated faucets or zero-clearance shower stalls, Henry Kitchen & Bath is your one-stop resource for innovative, attractive design products and services. “Hey, none of wants to admit it, but we – and those we care for – are getting older. 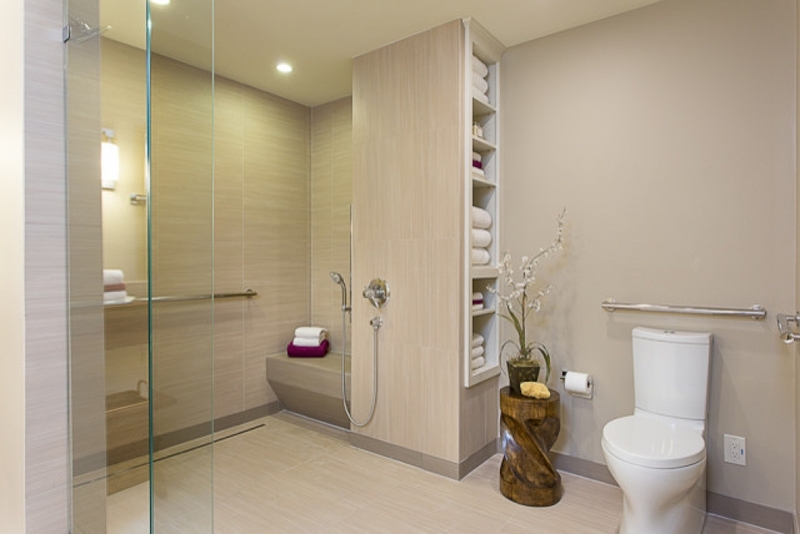 It’s just a fact of life,” says Murray Fishman, president of Henry Kitchen & Bath. 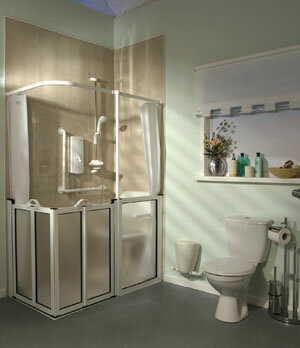 “Making a home accessible can be a nice accommodation or a necessity. The options for beauty and function are growing, exponentially. Manufacturers are constantly introducing new products that leave the institutional look in the past and embrace the most current styles and technologies. Delta is a perfect example. Their touch activated faucets are presented as a general market product, but the opportunities for use in Universal Living Design installations are absolutely endless. In cabinets, Wellborn and other manufacturers are making beautiful accessibility a true reality. These products and designs flow seamlessly into after-need, as well,” added Fishman. 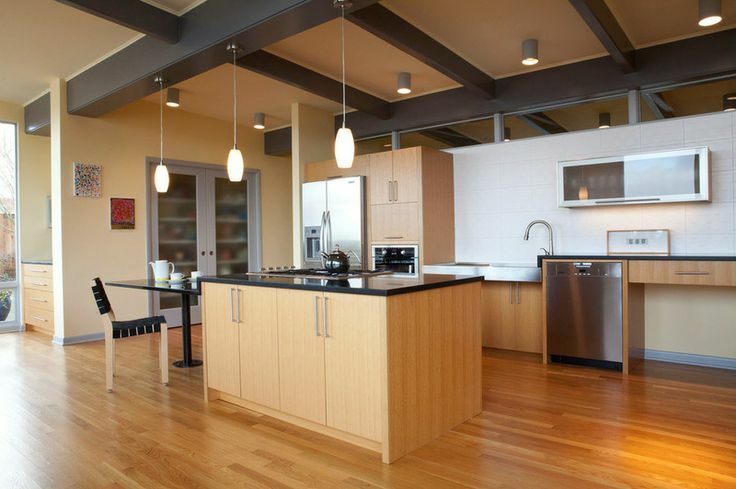 It is never too early to include Universal Living Design considerations into your remodel planning, and Henry’s expert design team can help make it look and feel great for years to come. Visit one of our showrooms for more information and to schedule a design consultation at one of their three area showroom locations. CREATE A HIGH-END LOOK THAT IS ADA COMPLIANT! SAVE TIME, MONEY, AND POTENTIAL FUTURE HEADACHES! Solve Installation & Warranty Problems Common in Traditional Concrete Base Constructions! The Tuff-Form Wet Floor Shower System has been designed to give customers the most straight forward and cost effective process for choosing, purchasing and installing a shower system for a domestic wet room. Designed to create wet-floor showers on wood or concrete for installation of ceramic tile or commercial grade non-slip vinyl flooring, with the added benefit of TRUE zero threshold entry. Tuff-Form is a former with pre-formed drain slope built in. Typical practices create the slope above the membrane. The Tuff-Form slope is created under the membrane, thus minimizing the possibility of pooling water and future mold problems. Requires only 7/8” recess into floor, is designed to sit on floor joist 16” on-center, and edge support minimizes the need to restructure the floor. Eliminates the need to profile the floor manually, no water dam of curb required. Can be cut on site, to any shape or size within 6” of drain. Offset waste position to avoid joist. Manufactured of GRP (Glass Reinforced Plastic) for maximum strength, no under base structural foam filling required. Can be used in bariatric applications of up to 560 lbs. 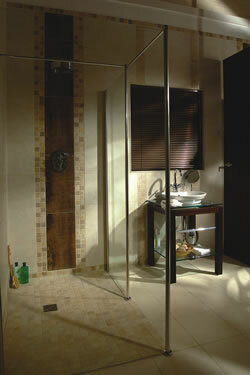 PATENTED DESIGN SAVES TIME AND MONEY ON ZERO THRESHOLD SHOWER INSTALLATION! Mullen shower bases from AKW are a new product in the U.S. and will save you time and money compared to typical construction practices for complete level entry showers. Mullen Base—compared to poured concrete showers, Mullen applications can save time and money compared to traditional labor intensive practices currently used. Does NOT require use of water “Retainer” to keep water from running out. Can be used on wood or concrete. Requires only 1” recess into floor, is designed to sit on floor joist 16” on-center, and edge support minimizes the need to restructure the floor, no water dam required, (can be surface mounted). Base can be cut to length in field (with kit). Intergrip® unique patented clamping edge creates a watertight joint between base & flooring. Anti-slip floor surface has proper slope built in. Ramp kit available for non-recessed installations, ramp clamps to base, and concealed screws secure to floor. Alcove and corner units available. 25 year warranty and UPC / IAPMO Certified. Removable, padded cushions in gray or blue to aid the visually impaired. Featuring closed cell foam that will not absorb water even if damaged. Seats feature gentle side-to-side ribbing and recessed top surface reducing the risk of sliding off the front of the seat. Rubber Wood Slatted Model – a very popular seat because of it’s stylish, up-scale appearance. Extremely safe and approved for Bariatric users, with a weight capacity of up to 558 pounds. 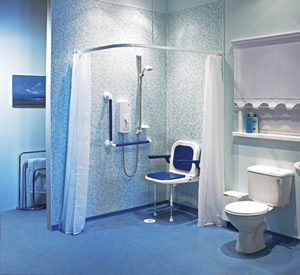 Seat, armrest & legs fold up for greater usable space in shower when seat is not in use. Seats fold up past 90 degrees to minimize chance of falling back down, each armrest operates independently, adjustable +/- 5 deg. to suit the individual & has a weight capacity of 122 lbs. Available with or without backrest and armrest. Stainless steel frame is white powder coated. Seats are manufactured from a white formed polyethylene which is both strong & comfortable. Drain holes reduce water retention & assist in cleaning. Seats & backs can be removed for cleaning & installation. Hinges are designed to minimize pinch points during use. All seats include 2 legs, each adjustable height & one has fine adjustment to accommodate slope in floors such as pitch to drain. Each leg includes a white protective rubber foot. Seats available with or without U-shaped aperture to facilitate intimate hygiene. 20 styles/ variations to choose from. Adjustable height at time of installation, and incorporate a minimum of 8 to 10 fasteners. Lifetime Warranty on stainless steel frame. 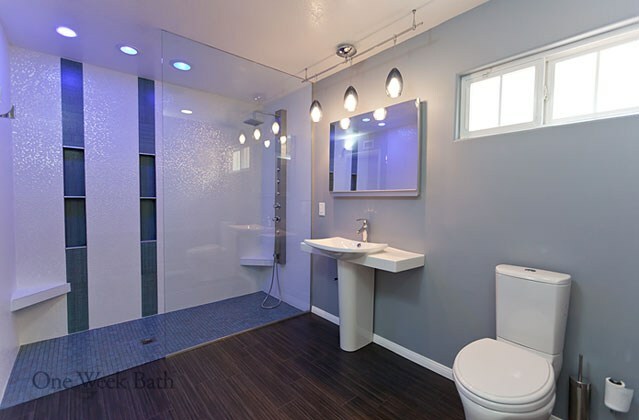 AKW offers the only shower door on the U.S. Market to offer this European look while 1/2 height design allows care-provider to assist bather while controlling water deflection and staying dry. Bi-fold design allow swing in either direction up to 180 degrees for greater opening area, enabling the door to be positioned out of the way. Locks in the open position. Incorporates rise and fall hinge, (door rises off floor when opening, lowers door to floor when closing) avoids dragging door across the floor. Six edge wiper blade seal on bottom of doors. Corner, alcove, & portable doors available. Adjustable width to accommodate variations in walls. Reinforced aluminum tubular core is encased by UPVC extruded plastic so that it’s warm to the touch, unlike cold stainless steel. Flanges have 5 fixing points for easier installation. 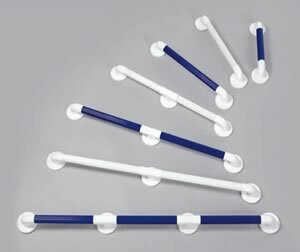 White and blue grab bar options for people with limited vision. Fluted surface offers additional grip. Bariatric rating – Can support up to 419 pounds. Integral flange construction ensures that no metal connections are exposed, therefore no electrical earthing is required. A variety of sizes, including 12”, 16”, 18”, 24”, 32”, 36”, 42” in length, among others. Units with legs are rated for 441 pounds. Available with or without support leg. Locks in the up position. Option of white or blue. 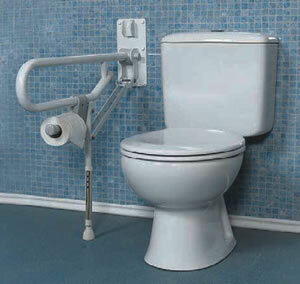 The AKW Double Fold-Up Support Bar w/ Adjustable Leg lets you choose if you’d like it to have a toilet paper holder included. Provides grip while using stairs without having to release hold. 90 degree turns around the newel post. Available as both right and left handrails. 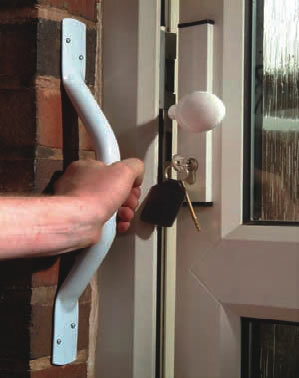 Offset design allows user to step up to & through doorway without releasing grip. Designed for indoor and outdoor use by doorways, to help step up or step into doorway, with excellent corrosion resistance. Narrower mounting flange allows for fitting by doors. Available in white or brown, to offer choices that match other colors by door.